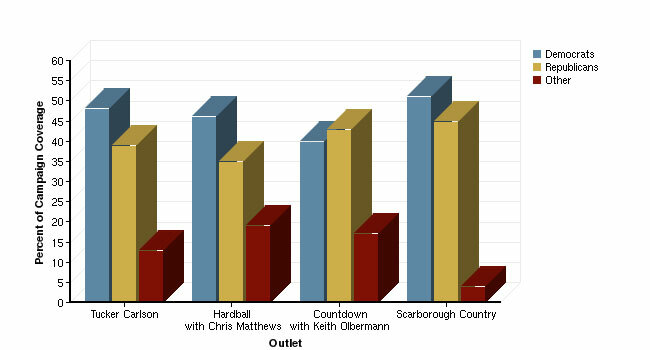 Cable news was the most focused on the campaign. That sector of the media devoted 12% of the newshole studied in PEJ’s index to the campaign, up a quarter from 9% in the first three months of the year. And among the three competing channels there, MSNBC far out-paced the others. It devoted fully 21% of its airtime on the campaign, more than twice that of either CNN (9%) or Fox News (10%). Election coverage also topped the list of stories in radio news (10% of its newshole) and newspapers (8%). The only other genre in which campaign news did not top the list was network TV, but here it ranked second and was a just a half a percentage point shy of the top story, events in Iraq. After rounding, both the campaign and events in Iraq accounted for roughly 7% of the newshole. It should be noted, though, that morning news shows are more focused on the campaign so far this year than the evening newscasts. Another change in campaign coverage in the second quarter of the year is that as reporting increased, the Democrats’ big lead in exposure diminished. Earlier in the year, Democrats outscored Republicans by more than 2-to-1 (61% versus 24%). 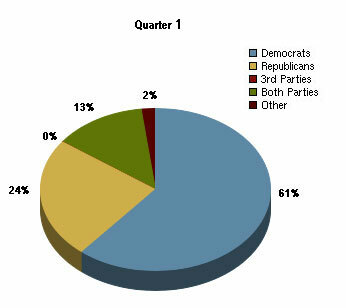 In the second quarter, however, the two parties ended up with nearly equal amounts of the newshole: 42% Democrats and 41% Republicans. Another 11% of the coverage considered both parties together. The second quarter also brought the addition of a potential 3rd party candidate—New York Mayor Michael Bloomberg, who switched his party affiliation to independent on June 19.2 The press was fascinated. For June, coverage of Bloomberg alone accounted for 11% of all the election coverage in the PEJ News Index. For the quarter, coverage of Bloomberg made up 4% of the campaign coverage. The Republican dominance in May suggests also the degree to which the campaign coverage is driven by planned events—often events organized by the media themselves—rather than by anything the candidates have said about their plans for the country or certain voting groups. The month Republicans finally outstripped Democrats in coverage was one in which there were two different Republican debates (and none on the Democratic side) as well as public statements by two potential new candidates—Fred Thompson and Newt Gingrich (neither of which have as yet announced). 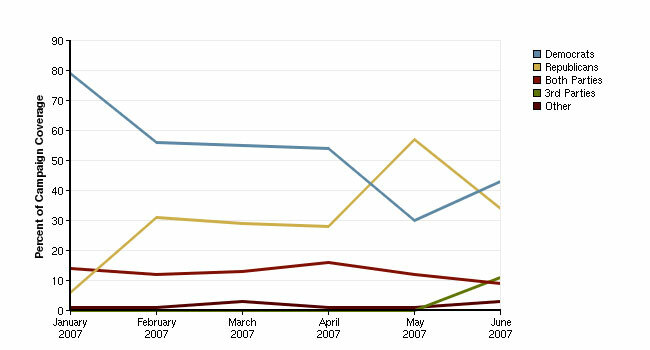 In June, the pendulum quickly swung back to the Democrats and left them clearly in the lead for the first half of 2007. For the full six-months, Democrats grabbed 51% of the newshole in the Index, compared with 33% for Republican. Another 12% of the coverage was about both parties. Does the amount of press coverage devoted to one party or another differ by media sector, or by news outlet? There are some slight differences depending on which sector or type of media one consumes. 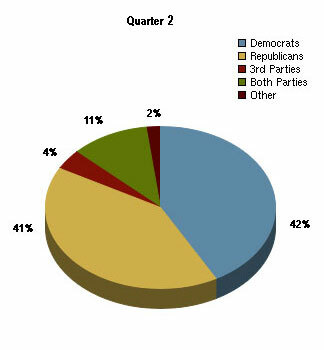 Democratic candidates got more coverage in the second quarter in all sectors except for newspapers and cable. In those two sectors where Democrats did not get the majority of the newshole, the Republican edge was so slight that over the course of the entire six month period, the Democrats still come out on top. 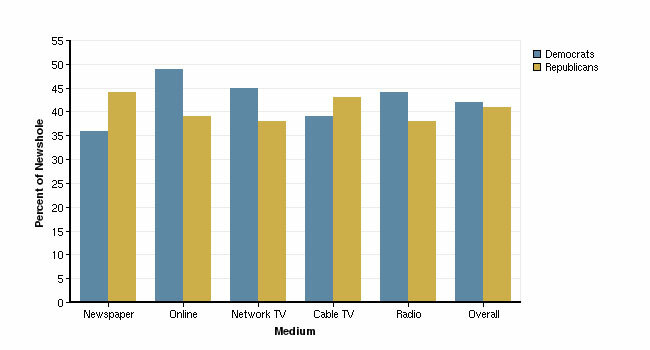 And what about the three cable news channels, where audience demographics—particularly along political lines—differ more than outlets in other genres? Data from the Pew Research Center for the People and the Press suggest that Fox News’ audience tilts Republican and conservative, while CNN’s and now MSNBC’s tilts Democratic and liberal.3 In covering the campaign, did the networks slot stories accordingly, giving more airtime to the party preferences of their core audiences? Overall the three cable channels in the second quarter and year to date are strikingly similar in their party breakdowns. From April 1 though June 29, each devoted 37-40% of the air-time studied to Democrats and 41-44% to Republicans (the percentages spent on dual-party stories varied a bit more). On Fox, for the first six months of the year, Brit Hume’s 6 pm program (EST) for the days captured was fairly mixed (40% of the campaign coverage about GOP candidates versus 33% about Democrats). His program also spent the greatest amount of story-time considering candidates from both parties (20%). At the 8 p.m. hour, The O’Reilly Factor stuck with them Democrats, 64% versus 27%. But at 9 pm, Hannity & Colmes moved the dial back toward the middle with Democrats outpacing Republicans over the first six months of 2007 (48% versus 34%). On CNN, the picture was also split. The early evening program hosted by Lou Dobbs was evenly divided, 43% Democrats versus 43% Republicans and 12% a mix of both. An hour later, on Wolf Blitzer’s “Situation Room,” a much larger gap emerged. Democrats had nearly twice the airtime of Republicans (50% versus 27%). On Paula Zahn’s program at 8 o’clock, Democrats held even more of the stage (62% Democrats versus 25% Republicans and 11% mixed). But tune into Anderson Cooper at 10 pm and it was the near reverse: From January through June on the days studied, Republicans commanded 50% of the airtime versus 29% for Democrats and 17% mixed. On the Washington-centric MSNBC, though, the programs studied proved much more similar to each other. On three of the four programs examined—Tucker Carlson at 6 pm, Chris Matthews at 7 pm, and Scarborough Country at 9:00 p.m.—Democrats ever so slightly edged out Republicans. The one exception was Countdown with Keith Olbermann whose coverage was fairly even – 43% for Republicans and 40% for Democrats. The largest gap found was on Hardball but even here, for the days studied, the gap was only 46% Democrats to 35% Republicans. It is important to note that these data speak to the quantity of coverage given to each party’s candidates, not tone of that coverage. A story about Republicans could be favorable, unfavorable or neutral to that party. Likewise for Democrats. Nonetheless, the differences suggest something about the influence of hosts and their staffs over the content of their shows. Beyond party, which individual candidates were winning the “free media” race for the most ink and airtime? In addition we separately examined mentions of two potential candidates that received significant attention in the press the quarter: Republican Fred Thompson and New York Mayor Bloomberg, who switched his party affiliated to Independent in June. In the second three months of the year, Barack Obama, the first-term Illinois Senator, proved the top newsmaker on the Democratic side and overall, with the most total mentions (622) in both newspapers and on network television. Hillary Clinton, the frontrunner in the Democratic polls, was next at 566, followed by John Edwards at 367. That result is something of a reversal from the first three months of the year when Clinton led over Obama by roughly 10% (742 vs. 672). Edwards was a distant third at 249. It is also worth noting that mentions of both Clinton and Obama dropped in the second quarter while they rose for Edwards. Obama’s lead, however, was not across the board. The former First Lady still led on network TV by a 304 to 290 margin with Edwards next at 189. In newspaper stories, Obama did better than Clinton, 332 to 262 with Edwards at 178. In the Republican field, the number of mentions among the three leading contenders was more evenly split, and none came close to the numbers of the top two Democrats: 383 for Senator John McCain this quarter, 341 for Rudy Giuliani and 318 for Mitt Romney. The candidates were just as close to each other (if not a bit closer) in the first quarter and followed the same pecking order. McCain led with 284 mentions, followed by Giuliani at 266 and Romney at 241. Looking at newspaper and network TV coverage separately, the newspaper competition was virtually a three-way tie with Giuliani and Romney at 124 and McCain at 123. McCain outdistanced his rivals on TV, with 260 mentions compared to 217 for Giuliani and 194 for Romney. The two newest additions to the press circuit—if not to the official candidate pages—seem to be catching up quickly. The candidate in waiting from Tennessee, Fred Thompson, garnered 221 mentions. And Mayor Bloomberg scored 135 mentions, certainly a more than a step behind the leading candidates. Still, considering that most of this attention came in one month, June, when he announced his party switch, and that he has not even officially announced yet, the numbers are sizable. The Lexis-Nexis search also confirms PEJ’s findings that Republicans have clearly closed the coverage gap with Democrats in the last quarter. hyperlink to last quarter election page. In the first quarter, Clinton, Obama and Edwards generated more than twice the number of network and newspaper mentions as McCain, Giuliani and Romney—1663 to 791. This quarter that gap narrowed; 1,555 for the three Democrats compared to 1,042 for the three Republicans. And if you add in Thompson and Bloomberg the margin shrinks even further. 1.The Index studies the top five stories on five different websites, CNN.com, Yahoo News, MSNBC.com, Google News and AOL News. For details see complete index methodology. 4. The prime time cable programs captured and analyzed rotate on a daily rotation. 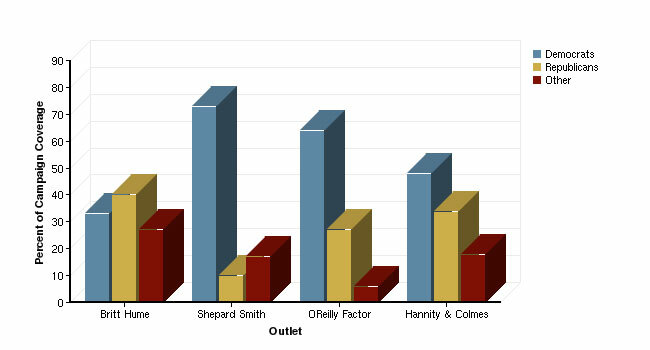 On Fox and CNN, three out of four programs are analyzed daily. On MSNBC, it is two out of four. For the rotation schedule see the Methodology.